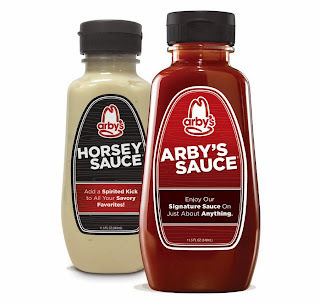 Arby's is getting into the sauce selling business (at least for a little while) with the sale of new limited-time-only bottled Horsey sauce and Arby's sauce at participating Arby's restaurants nationwide. The chain was testing the bottled sauces earlier this year. The bottles carry a suggested retail price of $2.49 per bottle and are also available in a gift pack with two bottles for $4.79. Both sauces come in 11.5-ounce bottles and are only available for a limited time while supplies last. If you've never tried them, Horsey Sauce is Arby's horseradish-mayo blend and Arby's Sauce is the chain's signature barbecue sauce.